Jean Piaget was interested in was how human beings transform, that’s what growth is: growth is transformation. There are developmental disturbances in every single person coming into treatment. We have got these areas of identity, emotion regulation, emotional awareness, cognitive ability (my ability to think in more complex ways) that’s actually worth understanding. There was a guy named Jean Piaget, who was one of the founders of Developmental Psychology, he was also a revolutionary biologist, a mathematician… a deep brilliant man, study Jean Piaget. Jean Piaget spent huge parts of his life watching kids play. What he was interested in was how human beings transform, that’s what growth is: growth is transformation. He was particularly interested in the uniform, universal ways that human beings grow, learn, change and transform in predictable periods under predictable circumstances. What he discovered was that human beings cross-culturally, and cross-gender, grow in particular ways. For example, if you ask a 3-year-old to do multiplication, it’s not going to happen. Around 4-5 years old kids can start to add up oranges. One orange plus two oranges makes 3, 2+2 is 4, they can do addition. If you ask them to do mathematics, they actually do not have the structure of the mind, the capacity in that moment, manifested to be able to do abstract math. It doesn’t operate as easily in things that you can grab and do, in more complex abstract, mathematical terms. That’s in every area of our life, so development is having more complex and nuanced ways of interacting and thinking about the world as we grow older. That’s cognitive development, and we have all these areas of cognitive development, emotional awareness, emotion regulation, identity… and then one that’s very rarely talked about by psychologists because it’s very controversial. It’s at the core of being human, which is moral development. How I think about issues of right and wrong and my understanding and ability to articulate to myself why I think something is right, and why I think something is wrong. In all of these areas, we can develop uniformly, and in all of these areas, we can become disordered. What you’ll find if you do some psychometric testing on people in the addiction population, or you do developmental testing in all of these areas, you’ll find that there are disturbances in every single person coming into treatment. My parents actually who are developmental psychologists did a longitudinal study of 700 people coming into treatment, and all 700 people had an identifiable developmental disturbance outside of the norm of the population. It’s the same kind of developmental disturbances that you see in a mentally ill population, and also the criminal population, and as we know there is a great overlap between those populations. Part of recovery, if that’s part and parcel of addiction and developmental disorders, then part and parcel of recovery is treating those developmental disorders. First, we have to be able to identify them, people will say when somebody comes in (to recovery), clearly you’re stuck and you can almost feel people when they’re having issues and coming into treatment beyond addiction. But understanding what areas they’re stuck in is much more complex and it’s one of the areas that’s going to have massive development in treatment. Guess what, you’re not stuck cognitively, you’re stuck emotionally, ok how do we deal with that? Guess what, you aren’t stuck cognitively or emotionally, you’re stuck in your identity and your vision of seeing yourself. These areas are well researched in the field of psychology and we even have therapeutic approaches to deal with them. What we haven’t developed well is a method to identify and then treat that in the addiction population. That’s what’s happening right now and one of the things we do in our treatment program. A major developmental split we see is the split between self and other. One of the things that we work with in recovery are called splits, and splits are part of the psyche, part of the self that split off from each other and are not communicating well with each other. A common example would be my cognitive capacity, my ability to think and reason, and my emotional capacity. Those two capacities should grow together relatively close. A split is where one area of the self or structure of the mind continues to grow, and the other one gets stuck. So let’s say I continue to grow cognitively; I go to college, I am able to reason and think well. But for some reason, usually some kind of trauma or traumatic dynamic or drug use, I don’t grow in the area of emotion regulation. There you have somebody who is very reasonable and under stress is 7 years old. Throws tantrums, we all know people like that who we can say the tail wags the dog. They are very reasonable, they’re smart, sophisticated, and mature when it comes to their thoughts, but emotionally they’re tyrants. That is a split, between emotion regulation and cognitive capacity. One of the major splits we deal with is the split between self and other. I have to negotiate and navigate the interpersonal sphere and I have to constantly understand where I stop and start, both in my field of existence and in my boundaries. In fact, you can equate mental health directly to how good my boundaries are. Really good boundaries basically equal really good mental health. An example of bad mental health, meaning mental health that has really gone chaotic or awry is psychosis, someone who is clinically detached from reality, someone who is psychotic. If you have ever walked the streets of San Francisco or downtown LA and you see a psychotic person, one of the things you’ll see is they have terrible boundaries. They will cuss you out right in your face and you’re like wait a minute here. Mental health and boundaries are pretty much equated and one of the areas where people need a lot of work when they come into recovery is figuring out how to navigate and negotiate Self and Other. It’s easy to pull back into myself, it’s easy to accommodate into the other, figuring out how to navigate that in the complexity of our lives. For some people that’s really easy with friends and family, well I don’t think for anyone it’s easy, but they’ve adapted to it and know how to do it, but they don’t know how to do it in multiple roles. It’s a certain level of development. How can I be a husband, a father, a worker, an employer, an employee, a friend? These are different roles with different boundaries and different demands and different competing claims. Part of mental health and maturity, and part of recovery is becoming attuned to those fields and figuring out my general boundaries and my specific boundaries in each moment and each role. It’s a tremendous amount of work, and it’s why recovery is so hard. You’re not just treating your drug addiction, you’re also figuring out how to live well. Living well means figuring out how to navigate what it means to be a self, and what it means to care about the other. You’d be shocked if you actually sat with someone who was in some sort of distress and said, “what do you feel right now”? And they could not answer. 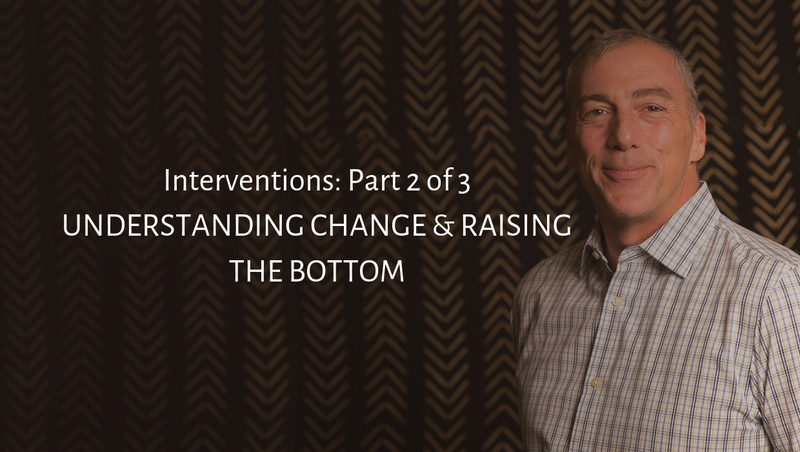 One of the ways to understand addiction, that recently became popular, that I’ve been engaged in, in this blog or this conversation for 8-10 years, is the relationship between development and addiction. There was actually a popular book called “The Unbroken Brain” which was looking at addiction as a kind of learning disorder. That’s complicated and there are parts of it that I like, parts of it that I don’t. Putting that aside, I think to look at addiction as a part of the developmental process and when addiction becomes full-blown addiction as somebody being stuck in their development is a really insightful way to understand what’s happening with people in their addiction. I have never met somebody who is coming into recovery from addiction that is not stunted in some particular areas of the self. That is not stuck or split in a particular area of growth in a statistically identifiable way. So the most common example, that makes a lot of sense to people, is when people stop growing in the realm of emotional awareness and emotional regulation but grow in other areas. That makes sense, right? Addiction could be categorized as an impulse disorder, in some ways. I can’t stop myself from impulsively engaging in this behavior over and over again. What is an impulse disorder? It is the inability to regulate my cravings and emotions. On top of that, there is another area, which is around emotional awareness; actually not being aware of what’s happening inside of me. You’d be shocked if you actually sat with someone who was in some sort of distress and said, “what do you feel right now”? To have them label their feeling, and for huge parts of the population both in the recovery population and otherwise actually aren’t very good at identifying and being aware of their feelings. Being aware of your feelings is somewhat of a prerequisite to being able to work with them or regulate them. If you don’t know you’re having them in any real way, cognitively, it’s hard to step back from them and do something about them. And just telling someone to relax usually isn’t helpful. Approaching what’s happening in the background (unconsciously), a little more actively than people often do, you see much more profound effects. and there are forces and drives inside of me that manifest in my feelings, my emotions, my behaviors, the thoughts and images inside of my mind that I’m not aware of. That there is a hidden realm to the consciousness and Freud and Jung and the founders of analysis came along and that was a discovery. A lot of times, people don’t know how to do therapy right. Now sometimes that’s good, because the therapist wants to work with whatever is in the room, they don’t want to instruct the client. But I think there are certain modalities of therapy where of instructing the client on the most helpful way to approach the therapeutic process is actually helpful. But I had to discover that on my own. I’ve found that in therapy, for me at this phase of my life, that being conscious of the things that aren’t in the front of my mind but in the back of my mind and speaking them out loud is helpful. If one of the points of certain types of therapy is to gain access to the parts of ourselves that we’re not really conscious of then I think approaching what’s happening in the background, maybe a little more actively than people often do, you see much more profound effects. In terms of your own understanding, biases, belief systems that are buried real deep in the bottom of the mind. Psychology has taken a central role lately, but traditionally, it is not ideal for treating addiction. Its a newer phenomenon that therapy has taken a central role in the world of recovery. Part of me is rubbed a little wrong by that. It’s not that I am anti-therapy, both my parents are psychologists I actually love psychology. I’m fascinated by it. But traditionally, we have an understanding that individual Psychotherapy is not a very effective way to treat addiction. What you’ll find most commonly is somebody’s afraid to enter into the world of recovery for a variety of reasons, so they go see a therapist – may be an addiction specialist or maybe just a therapist – and I think the most common story is somebody will see a therapist for months or even years while still continuing to engage in their addiction maybe with some improvement maybe with no improvement. It’s kind of a shame to me that somebody might be in therapy for five, six, seven, eight years I would hope that therapists out there recommend that early, and I also understand that if the clients not willing to go into treatment or to seek out some recovery that the therapist is stuck. Understanding the role of therapy and Recovery is a fascinating conversation. In general, my belief (and this is complex in nuanced) is that people have to immerse themselves in a culture of recovery and integrate recovery as part of their identity as the primary task of recovery. And that’s up front. Upfront I have to challenge myself to admit that I have an addiction problem that I’ve not been able to solve. Then I have to take on the task of saying “okay, I’m a person who suffers from Addiction” and in order to treat this condition, I need to be a person in recovery. I need to be a person who identifies myself as someone in recovery from this condition just like I would if I diabetes. If I had a horrible case of diabetes then my recovery from that, or even a cancer survivor, I would identify as a cancer survivor. It almost killed me! Then therapy comes along in order to help me to better understand myself and treat the underlying emotional conditions that existed, maybe prior to my addiction. In all different dramas in different ways of being different blocks that I had etc on that caused me to suffer that I then use drugs and alcohol to treat so I think of therapy as by and large the later stages of recovery. At first, I have to be a person in recovery then I can work on this other stuff because if I’m not a person to recover, continue to use I’m not going to get any therapeutic work done. There are exceptions. The exceptions to that are if I have trauma and it’s so severe it’s getting in the way of me being able to identify as somebody in recovery. So if the psychological problem or even psychiatric problem is so severe that I can’t engage. An easy example is if I have a really hard time regulating my emotions. Incredibly impulsive. It will be impossible for me to engage in recovery because I can’t sit still, I can’t stop talking, I can’t take it in, take information and reality in, so a specialist, a therapeutic specialist would have to come in and treat my Emotion Regulation Impulse Disorder in order for me to engage in recovery.